Jane Austen was born in 1775 at Steventon, Hampshire in southern England, where her father was a minister. She was the sixth child in a family of seven children. The family was very close, and Jane had a particular closeness to her sister Cassandra. Although she attended boarding school for a short while, she was mostly educated at home. Both she and Cassandra were attractive and attended country parties; neither of them married, although Jane had several proposals. Much of Jane’s life is captured in the letters that she wrote to her sister, but Cassandra cut out any references there might have been about Jane’s intimate, private life and her innermost thoughts. In spite of the missing information, the letters retain flashes of sharp wit and occasional coarseness. Jane began to write at a young age. Pride and Prejudice, her most popular novel, was the first to be written, although not the first published. She wrote on it for several years and finally completed it as First Impressions in 1797. It, however, was not accepted for publication until 1813, when it appeared with its current version with its new title. As a result, Sense and Sensibility was published first, in 1811. 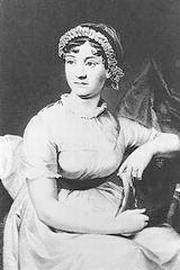 Her other four novels, Mansfield Park, Emma, Northanger Abbey, and Persuasion were all published between 1814 and 1818. She also wrote six minor works and one unfinished novel. Because she wanted to avoid attention, most of her work was not published under her name. When Mr. Austen retired in 1801, the family moved to Bath, where they lived until Mr. Austen’s death. The family then moved to Southampton in 1806, to Chawton in 1809, and then again to Hampshire. A few days before her sudden death in 1817, she lodged in Winchester.